There are days when I understand that mainstream kid-and-food predilection, pasta with butter. I do. I don’t like it, as a construct, and I don’t think it’s a good idea to serve it to kids very often (and certainly not as an entire MEAL), but there are days when it’s cold out, or you feel a little under the weather, or you feel like life has kicked you in the teeth…. and those are pasta with butter days. In honor of those days, I’ve put together this extremely simple, humble, and slightly more nutritious homage. Made with nourishing broth and with a good dose of leafy greens, this is a comfort lunch you can feel okay packing, but it’s also a comfort lunch that will channel the simplicity of a good old plate of pasta with a dollop of butter on top. 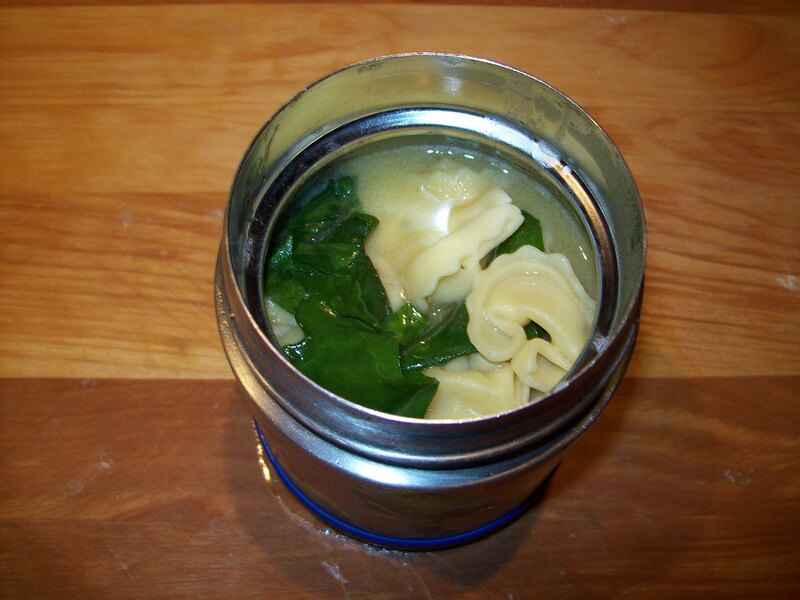 On the coldest winter day, a thermos of green-y tortellini might be just the right thing to pack off to school with a sniffly little one. Combine the tortellini and stock in a medium saucepan. Bring to a boil and cook, covered, until the tortellini are done (they will have absorbed some of the liquid in the process). Remove from the heat, and stir in the salt, pepper, kale, cheese, and butter. Spoon into preheated thermoses.